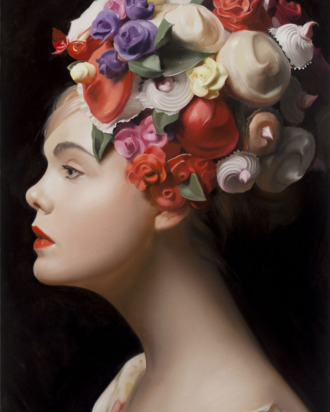 New York Magazine’s “selfie” — Will Cotton’s painting of Elle Fanning, Elle With Cupcakes, which was the cover of New York’s spring 2013 fashion issue. © Will Cotton. Courtesy the artist. Miami’s annual art-world circus opened a week ago today, and it’s been a bit of a blur. It’s probably even been a blur to read about. And as the hand-stamps fade and the pixie dust settles, we’re starting to ask ourselves: What did we really take away from Miami’s art fair this year? What actually important things happened between the celebrity DJs and Disaronno bars? Here’s a list of ten. 1. Miamians joined in nationwide protests. Those who weren’t blinded by the glare of Jeff Koons balloons at the fair’s VIP preview on Wednesday probably noticed that a grand jury did not indict the policeman who killed Eric Garner. A few days later, “Shut It Down” protesters blocked off I-195 to protest the decision. Many also commemorated the loss of 18-year-old Miami graffiti artist Israel “Reefa” Hernández-Llach, who died after police Tasered him last year. For an event where a text painting counts as a bold political statement, in a city with a reputation for superficial, this was … something. 2. The coronation of Lucy Dodd. 3. The Edition is the new Delano. Hotelier Ian Schrager first introduced his luxury brand to South Beach with the Delano in 1995. But this year, many of the parties moved upshore to his latest “lifestyle property,” the Edition, which comes complete with a basement bowling alley and ice-skating rink. The hotel was out of the way, and its public spaces made it look something like a brothel from the future, but somehow, it managed to be the center of things almost every night (maybe thanks to the free rooms Schrager handed out to Marina Abramovic, Klaus Biesenbach, and friends?). 4. Dance is the next big thing. One of the most-talked-about works of the week was Ryan McNamara’s immersive (and very sold-out) performance, “MEEM 4 MIAMI: a Story Ballet About the Internet.” Meanwhile, Ryan Heffington, the choreographer behind Sia’s “Chandelier” video, which has nearly 370 million YouTube views to date, staged a “punk-rock water ballet” at the Ritz Carlton South Beach, and the Shen Wei Dance Company performed at the annual Artsy dance party. 5. Younger artists stole the show — though the collectors calling those showing at ABMB and NADA “really emerging” artists are probably kidding themselves. 7. Sadie Coles is now a major, major blue-chip force. The billionaire collectors Peter Brant and Steven Cohen were seen considering the thousands of green ceramic Urs Fischer raindrops suspended over the Sadie Coles HQ booth. The dealer has long been a respected figure on the London art scene, but Coles, who also shows Matthew Barney, Richard Prince, and Elizabeth Peyton, opened a new, 6,000-square-foot West End gallery last year and now seems poised to enter the hallowed ranks of blue-chip dealers like David Zwirner and Larry Gagosian. 8. Miami christened its new Institute of Contemporary Art. “For me, one of the most exciting pieces of news is the birth of the Miami ICA, which opened with two shows by young artists, Andra Ursuta and Pedro Reyes,” said the New Museum curator Massimiliano Gioni. Several trustees from the Museum of Contemporary Art North Miami (MoCA NoMi) departed amid disputes with the city and formed the ICA this year. Although the older institution is keeping the majority of its collection, many of the best works are said to be headed to the ICA, helmed by former wunderkind New York art critic Alex Gartenfeld, who’s still in his 20s. 9. But MoCA NoMi is still kicking. New director Babacar M’Bow has been rebranding the museum as the homegrown alternative to the ICA. The institution kicked off Basel Week with an exhibition of Caribbean artists. 10. People stopped being snarky about pop — real pop. Like Miley Cyrus pop. The singer gave it her all at Jeffrey Deitch’s big Miami comeback party, dancing inside a stuffed rainbow, smoking a joint, and twerking against Flaming Lips front man Wayne Coyne, who duetted with her onstage. We’re not so sure she’s an “outsider” artist on the level of Mike Kelley, as Deitch claimed. But she brought the right attitude, shouting at one point, “You thought this was a respected place where you could escape me? !” And folks in the audience seemed genuine when talking about her as a “real deal” performance artist. Which maybe shouldn’t be too surprising, given how fully and unironically, unskeptically, un-eye-rollingly Kanye West and Kim Kardashian were embraced down there.